Manufacturer Twisted Electrons shows off their hapiNES chiptune synthesizer based on the sound chip from the Nintendo Entertainment System, named after the Egyptian god of the Nile inundation. Not to be confused with Khnum, whom the Egyptians regarded as the source of the Nile. We got a preview of this back in May with the µAcid8. Twisted Electrons are now accepting pre-orders for €100. Quanta Granular Synth by Audio Damage, Inc.
Today Audio Damage, Inc. brought Quanta Granular Synth to iOS! That was fast! We only just got word of this in May, it released on desktops earlier this month, and already we have it on iOS. The iOS version supports both Inter-App Audio and AUv3, and is fully compatible with the desktop version! The full feature list is impressive; with many audio formats supported, MIDI Polyphonic Expression (MPE), and a modulation matrix! Quanta arrives with presets from several notable sound designers, including Throbbing Gristle's Chris Carter! There is a warning about Quanta being CPU heavy, and may require a very recent model of iPad. There is a workaround suggested in the iTunes description, if you encounter any CPU chug. Quanta Granular Synth is on sale now until September 1st. The sale price is $80 on desktop, and $8 on iOS! Quanta is a six-voice granular synthesizer for iOS11+ in both standalone (with Inter-App Audio) and AudioUnit V3 formats. Quanta for iPad is fully compatible with the full version of Quanta for macOS and Windows; visit audiodamage.com for a PDF manual, audio samples, and video demonstrations. Quanta will work on any iPad that can run iOS 11, but keep in mind that it is a feature-heavy desktop quality synthesizer, and would prefer a 2017/2018 iPad, or an iPad Pro. If you're experiencing CPU issues on lower-end machines with the standalone, try changing the main display to FEG or FLFO, which don't require redrawing and which will be significantly lower in CPU usage. Noise source features a "color" control that affects tonal characteristics of the noise. Can be injected directly into grain engine. Quanta understands both "legacy" MIDI and MPE. Use your Linnstrument, Roli controller, Haken Continuum, or Madrona Labs Soundplane (among others) to directly access per-note pressure, pitch bend, and modulation. Quanta's vector-based GUI is resolution-agnostic, and displays the same on every system and resolution. Easily resize the UI (per instance) to match your visual needs, from postage stamp to poster-sized. Doug Woods from thesoundtestroom shows off the iOS version in this Getting Started tutorial. 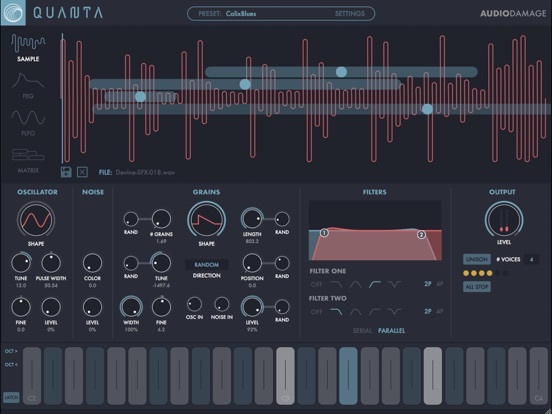 Bedroom Producers Blog got a preview of Audio Damage's next app, Quanta, at Superbooth! Developer Chris Randall introduces us to this extremely stylish looking new granular synth, which should arrive on iOS, macOS, and Windows in June. Audio Damage Quanta granular virtual synthesizer demo at Superbooth 2018. Quanta is a forthcoming granular virtual instrument for Windows, MacOS, and iOS. The expected release date is June 2018. Gaz Williams from Sonic State got an update on the development of Teenage Engineering's long-awaited OP-Z. This new take on the OP-1 instrument is designed with an app interface in mind. Here they show it off with an iPhone, and it looks pretty damn amazing. There is still no release date for OP-Z yet, but they have said the retail price will be $600. Sonic State got a demo of MuX, a virtual reality synthesis app for PC available now on Steam for $20... after you spend $500 on HTC VIVE gear, and a powerful enough PC. I've been waiting to see someone use VR in an interesting way beyond half-assed novelty games. MuX is definitely a much more serious approach. This goes even deeper than modular synthesis; down to the individual components of synthesis. There are even plans for MuX to interact with physical modular hardware in the future. Edo really knows the VR space - he makes it look so easy when he builds really interesting sound machines from basic 'physics' building blocks in the virtual landscape. It's a powerful concept - you can make sound generating machines in VR which either comply with the normal rules of physics as we know them in the 'real' world... or totally ignore them! Right now the sound generation is in the box, but soon it will communicate with external sound devices, so you can control your modular in VR - yes!